We have our 'Titre de Sejour', our permission to live in France. We thought, mistakenly, that once that hurdle had been jumped the rest would be easy. Well, there we go 'thinking' again! How foolish. One is the Carte Vitale – our medical insurance card. We have dropped the inch-thick file into the French paperwork abyss and are awaiting the initial refusal. First, let me explain that because we are American (and not EU) nothing is easy, everything is new and groundbreaking, and never, ever, ever been done before. If you are a member of the EU and you move to another EU country you take your driving license to the local authorities and they give you one of theirs. Because we are American we can't do that. In Andorra we accepted the inevitable and took the driving test. After we move to France we think: we have taken the tests in Andorra, we have valid Andorran licenses, Andorra is in Europe (though not the EU – thus the hitch). Therefore, this should be easy. We called: Yes, in fact, it is easy. Come on down, fill out a bit of paperwork and we'll give you French licenses. We did. It was easy! Rightly so! The denial came on Friday. It seems that in order to do an 'exchange' it had to be done within a year of becoming residents. We had not done it in a timely manner so we had to go to driving school, take all sorts of tests and pay a gazillion euros, thank you very much! But here's the thing: we applied within a year (3 months, actually) of being informed, (as in having actual knowledge of) that we were residents. We received our 'Titre' in March, 2006. It was already expired. We couldn't get our licenses before this because we didn't have the proper paperwork and, as far as we knew, were not entitled to because we were not legal residents. We couldn't get them after because the paperwork was expired. We filed for renewal of the expired 'Titre' which we received the last day of May. Now, for the first time since we moved here over 2 years ago, we are legally resident, we know we are legally resident and we have the proper, completed paperwork to prove it. Off we go to the bureaucrats to fill out the forms for the driving licenses…but, sorry, too late. You should have done this last year, we are told. "But last year we weren't legal residents" we exclaim. "Yes you were, it says so right here" they point out. "But we didn't know" we cry. "Well you should have" they answer. "But you didn't tell us" we shriek. "Oh, that's a different department"
Bam! Bam! with the big red Denied stamp, a smiling "bon journee" and we are dismissed. It's like a Mobius strip; the never-ending story! It makes my head hurt. Stay-tuned for Part VII – the end, finally! Still have a few tomatoes lurking? Enough for a simple soup? This is all about the tomatoes…. Purée tomatoes. Put into a saucepan, add paprika and heat just until boiling. Stir in goat cheese, heating until it melts. Remove, garnish with basil and serve. This soup is definitely all about the tomatoes! !I hope you are enjoying your holiday! Oh Katie…so much red tape! You must be so happy to have all of that behind you…and yes I have tomatoes – there is nothing better than tomato soup. I laugh everyday over your saga. I went through 18 months of hell at the Prefecture in Nice…so I can relate. I’m going to get some tomatoes tonight at the farmer’s market and make your soup with some left ovr goat cheese I need to use up. I’ll try and post about it. Such a nightmare. Reminds me of a friend I had in high school whose father was from Spain. When he moved to the US he had to take a driving test and failed it. He complained loudly to the DMV guy that he had been driving for 20 years. I guess we all fall into bad habits. That soup reminds me of something I had in London once that was one of the all time best soups I ever had. Can there actually BE anything more frustrating that foreign officialdom?! “We are the precedent.” – love that line! And the soup looks good! We got a lot of green ones again this year so I guess it will be chutney again… Damn the English weather!! 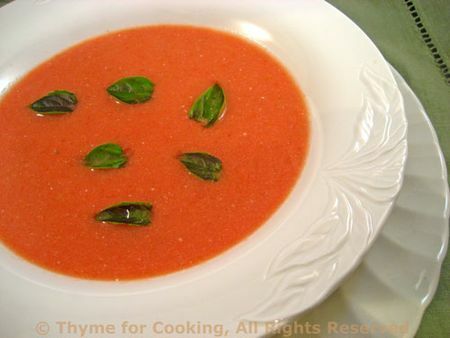 Val, holiday was great – tomato soup is always a favorite! Ina, very happy it’s done… of course, we renew every year. Meredith, it is funny – now! Hope you like the soup! Healy, we had more tomatoes this year than ever! Rachael, driving tests are scary, regardless of how long we’ve been doing it. Jeanne, green tomato and red pepper chutney! Yum!